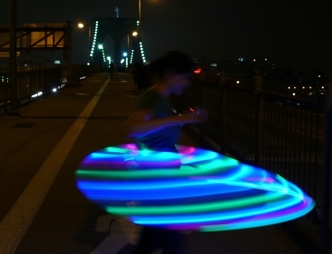 Use this Flexible tubing to create your own Foldable Collapsible LED Hoop. tubing you might find at a hardware store. hoop tubing, so the LEDs will shine brighter. 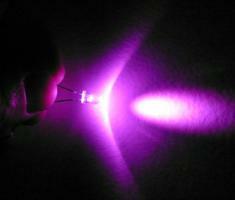 It is also more flexible than the standard 0.814″ x 1″ white LED tubing. And a little more flexible than standard “3/4 160PSI” black hoop tubing. the seem at the connector. Here are some good videos to show what it will look like when hooping. collapsed position as it may warp or overstress the tube near the connector. It will accept both non-rechargeable and rechargeable batteries. You can follow the standard hoop assembly instructions for non-rechargeable batteries. since it will last for over 500 recharge cycles, which is about 4-5 years of moderate use. connector so the tubing can twists easily. in the other end of the tubing where the LEDs and switch are. Then follow the rest of the basic rechargeable battery instructions. Available in 100 ft rolls at usplastics.com part number 58008. Shorter lengths available at McMaster part number 5181K11. which include the power source, connector, switch, wire and LEDs. Ccollapsible hoops are the BOMB at busy festivals like Shambhala! When you spin the hoop does the material keep the circle shape? I do not want it turning into an oval while hooping. it is more flexible than a standard adult hoop made from black 160 PSI 3/4 tubing. So I think it does turn into a bit of an oval shape when hooping, but its hard for me to notice it myself. How much does this pipe weigh with LED’s in it? The tubing alone is just about 1 lb. The rechargeable battery adds exactly 1.6 oz, and the wires and LEDs are 1.3 oz. So altogether you are at about 1 lbs 3 oz. But that’s not so bad for you because you can always add more weight. Especially if you want a more balanced hoop you can place two more dummy batteries equidistant from each other and add another 3 oz to bring you to 1 lb 6 oz. Then wrapping the wire in tape or bubble wrap to silence it will add some weight. And wrap a bunch of gaffers tape or electrical tape around the tube for traction or decoration and you are approaching your 2lbs. Is the flexible tubing closer to 1/2″, 3/4″, or 1″ 160 PSI black tubing? you definitely dont want to tape the joint. You can add the tape you want first then use a knife to cut the tape at the joint. then take another bit of black tape to cover the loose tape you just cut. one on the left, one on the right of the cut. but dont tape over cut you made at your joint. I might like to buy the flexible tubing locally. Can you tell me exactly what it is? Latex? Polyprene? ??? its low density polyethylene. I don’t think you’ll find it in a local store. But you can buy it online in rolls of 100 feet. Does this come with a special connector? Or do you just use a regular insert coupling like regular hoops? this page is just the tubing alone. you use a standard connector with it and it folds down normaly. does the size of the hoop matter when collapsing or can it be any size? Do you mean hoop diameter? I think it can be any size. Like 40 inch or 50 inch etc. If you mean tube thickness, the above tubing size (0.814 x 1 inch) is easier in my opinion to collapse than the thinner ones, mainly because the thinner tubes have smaller connectors. my hoop warped when i collapsed it and im having trouble getting back : ( any ideas? did it warp or did it kink sharply? If you leave it in the collapsed form for too long it could develop a “memory” of sorts. If it is slightly warped you can lying it flat on the ground and heating it with a blow dryer to soften the tubing. Then push it back into the circular shape or twist it if its warped that way. Even hold it in place for a minute or so as it cools. That should help. What type of tubing do you use for the rigid hoops? I like a large hoop (12-13 ft of hoop),and I find that the collapsible tubing becomes a little egg-shaped with higher speeds (like getting it from knees up to hips). I wonder how I would like a rigid hoop. Hi Kelly, You need to get natural HDPE tubing. Its on usplastics.com part number 58018. Its just not easy to fold in half so I would avoid it. How does the hoop stay together and not pop open? If it pops open can it ruin your wires? What are some good methods for keeping the hoop together? the maker kit comes with a plastic connector. It has sharp teeth that grip the insides of the tubing. its a tight fit and you have to heat the tubing to push it over the connector. If you are making a rechargeable version you connect both ends of the tube that way since you never have to open it, and it shouldnt pop open when using it. If you need to make it so that you can replace the battery you can either heat one side of the tubing when you need to open it, or you can sand down the sharp teeth on one side of the connector. if you do that you have to use tape around the seam to keep it together. Is it just the tubing that allows the hoop to collapse or do you do something different with the connector? Does the connector require sanding in order to swivel? Amanda the connector does not require any sanding. Once the tube is heated, connector installed, and the tube cools down again, it hugs the connector tightly. But it still allows rotation to collapse. I am interested in purchasing the 10.5 ft of cut flexible tubing from you but every link just keeps sending me back here or page where i have to order a 100ft roll from the other website. Are 10.5 ft cuts still avaliable? I don’t sell precut tubing anymore so I will remove the link that says “place your tube order here”. where I explain that you can buy it from USplastics. The part number is there in the first paragraph. The flexible tubing is item number 58008. Would Item #58007 3/4″ OD x .075 be a lighter tubing, or would it be equivalent to the 160 psi tubing from Lowes? I’m interested in making my first led hoop, but due to its heavier weight and firm composition, I’ve found that the aforementioned black tubing tends to limit me somewhat when practicing new moves. So I thought, why not buy one bundle of black and one of transparent. I would prefer something about a third lighter, which would provide enough room for tape/lights/batteries or whatever I want to add. Thank you! The 58007 will be lighter because it is simply smaller than the 160PSI black tubing. But it will not fit the rechargeable battery I show in the video on this page. If you are an avid hooper and want to try new tricks, you might want to stick with a rigid tubing like 58018 (same size as 160PSI black tubing) or 58017, thinner but still rigid. Hey I was wondering if this tubing could also be effective to use for non collapsible hoops? I’d like to have the option of making some collapsible and some perminant. Do collapsing the led hoop no interfer with the wiring at all? Sorry for the silly questions.. This will be my first led hoop so I’m trying to do as much research as possible to avoid spending more money than is necessary. Thank you so much by the way you site has helped soooo much! Will be ordering LEDs very soon!